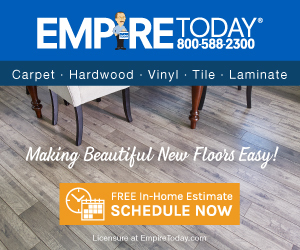 Next review Never use Empire today for flooring. DO NOT USE EMPIRE!!! Floor buckled after 1 year and they refuse to fix it without charging a $120 service fee. Floor was supposed to be guaranteed for 20 years. Read the fine print. Installation only guaranteed for a year which means if anything goes wrong after a year, you have to pay them $120, even if it is a manufacturer's defect. Salesperson completely lied to us after stating that we could call at anytime after the installation. They are absolute liars and misrepresent their products. Empire is a complete Scam. Use anyone but empire! Do not use Empire!!! Review #223742 is a subjective opinion of sclawlor. Empire told us lies also. Their salesperson came to the house and we thought he knew what he was talking about but apparently not. The salesperson told us one thing and and empire told us something else. I know how you feel. Their salespeople should actually know what they are talking about instead of just agreeing with the customer just to make a sale and having their customers be fustrated after the fact.